Rick Porcello looks a lot more like the pitcher who won the 2016 AL Cy Young Award than the one who lost 17 games last year. That is one welcome development for the Boston Red Sox. Porcello pitched seven scoreless innings, Mookie Betts drove in two runs and the Red Sox beat the New York Yankees 6-3 on Thursday night. Porcello stayed in after a 45-minute rain delay and was working on a no-hitter before Aaron Judge's leadoff double in the seventh. He struck out six and walked none in his third straight win to begin the year. "It seemed like he threw everything where he wanted to throw it," Boston first baseman Mitch Moreland said. "It's fun playing behind a guy when he's going like that. Rick's great. He was on display tonight." The 29-year-old Porcello downplayed the significance of the delay before the between the fifth and sixth innings. "I felt great," he said. "Honestly, it wasn't a big deal at all. I went back out there for the sixth and felt fine." One night after the benches cleared twice and the longtime rivals brawled during New York's 10-7 win, there were no such incidents in the finale of the three-game set. Boston slugger Hanley Ramirez departed with a bruised wrist after he was hit by a pitch in the first, but everyone stayed in their respective dugouts. The Red Sox won for the 10th time in 11 games, including a 14-1 victory over the Yankees on Tuesday. Moreland and Andrew Benintendi each had two hits and drove in a run. It was more than enough offense for Porcello (3-0), who returned to the mound after the rain subsided and put the Yankees down in order in the sixth. Giancarlo Stanton followed Judge's double with an infield hit, but Porcello retired Didi Gregorius on a fly ball to right and struck out Gary Sanchez and Aaron Hicks to end the inning. "This would have been nice after last night and getting beat up in Game 1, but we'll turn the page," New York manager Aaron Boone said. "I was frustrated in the first half of the game." Sanchez got New York on the board with a three-run double to center off Marcus Walden in the ninth. Craig Kimbrel then came in and got three outs for his fourth save. Boston manager Alex Cora said his relievers needed a break, so he had no problem bringing Porcello back out after the rain delay. "We needed length tonight," Cora said, "he did it." Yankees starter Sonny Gray (1-1) was pulled after a leadoff single by Moreland in the fourth. It was the seventh hit allowed by Gray, who also threw three wild pitches and hit a batter. He was charged with six runs and seven hits. Gray threw a pair of wild pitches in the second and second baseman Tyler Wade made an error on a throw to home plate as the Red Sox sent nine batters to the plate. "Kind of just one of those nights," Gray said. "Scuffling to find the zone, didn't execute very well and made it hard all the way around." Eduardo Nunez led off the second with an infield single and Jackie Bradley Jr. followed with a walk. Nunez advanced to third on a wild pitch and scored when Sandy Leon singled to right. Gray's troubles continued when he walked Brock Holt to load the bases with nobody out and Betts drove in Bradley with a sacrifice fly to center. Benintendi hit a grounder right at Wade, whose throw to home got past Sanchez and allowed Leon to score. Moreland followed with a single to score Holt and put the Red Sox up 4-0 before Gray finally got out of the inning. Yankees: Hicks (right intercostal strain) was reinstated from the 10-day disabled list and started at designated hitter. OF Shane Robinson was designated for assignment. Red Sox: Ramirez's X-rays did not show any fracture, the club said. ... Cora said LHP David Price, who left Wednesday's game in the first inning with tingling in his pitching hand, felt good playing catch Thursday and could start Monday against Baltimore. ... Boston placed LHP Bobby Poyner (strained hamstring) on the 10-day disabled list and recalled Walden from Triple-A Pawtucket. 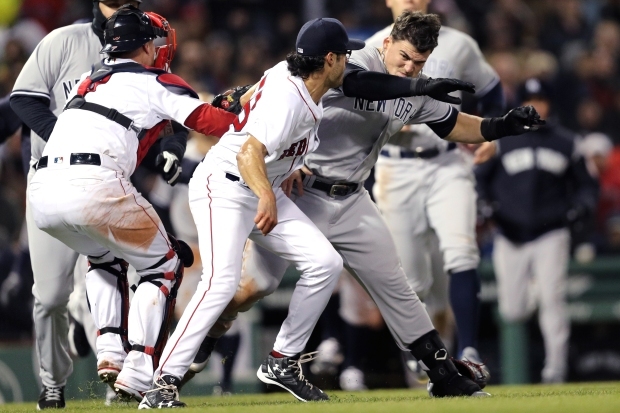 Major League Baseball suspended Boston reliever Joe Kelly for six games and New York's Tyler Austin for five games for their roles in the brawl Wednesday night. Each player appealed their punishments, and they are eligible to play while their appeals are considered. Kelly, Austin, Cora and Yankees third base coach Phil Nevin also were fined. Yankees: LHP Jordan Montgomery (0-0, 4.82 ERA) makes his third start of the season as New York opens a three-game series Friday night at Detroit against Tigers RHP Mike Fiers (1-0, 0.00 ERA). Red Sox: LHP Eduardo Rodriguez (0-0, 7.36 ERA) faces Baltimore RHP Chris Tillman (0-2, 8.68 ERA) in the opener of a four-game series against the Orioles.